New! 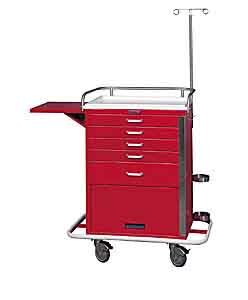 6403-1 Emergency Cart features 5 drawers and a storage compartment with flip-up door. Our high quality standards include a stainless steel breakaway locking system with 50 plastic seals, stainless steel i.v. pole, stainless steel top rail/push handle, and stainless steel oxygen tank holder. The separate bumper chassis with wrap-around padding provides superior stability. Fully accessorized with utility hooks, removable plastic top, six drawer trays, cardiac board, and a drop shelf. Ball-bearing drawer slides are guaranteed for life; cart includes a 5 year warranty against manufacturing defects. Custom drawer configurations are no extra charge. Latex-free.